Young beautiful woman in red dress , putting toys on a Christmas tree. Young couple in love, putting toys on a Christmas tree. 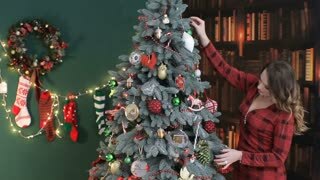 Young girl putting toy ornament on Christmas tree.